Review: Ito En Veggie Shot | Oyatsu Break! I’m just gonna come out and say it: It’s kinda hard to get your fill of fresh veggies in Japan. I know, anytime anyone makes a generalization about Japan, people with a different opinion or experience will pop up to smack that notion around, and so I try to make generalizations like that rarely. But. 4 trips now, almost 2 months total, and while travelling I just can’t seem to work veggies into my day to day diet the way I can while at home. On my first trip to Japan I was really feeling the lack of veggies and the delightful lethargy of restaurant food, junk food, and energy drinks, and I decided I needed to get as many healthy veggies into my stomach as quickly as possible. Luckily, your average Japanese convenience store has a remedy for pretty much everything, and while scanning the drink shelves I noticed Ito En Veggie Shot. Actually, I noticed the manufacturer Ito En had some sort of drink with vegetables (and a lemon) on the label, and the rest of the writing was in Japanese, I decided to go for it regardless of how awful it was going to taste–I needed the vegetables. See, I hate tomato juice. I loathe V8. I’ve always like carrots and sweet veggies, but the idea of this, a veggie cocktail, was seriously grossing me out. But health comes before pleasure, and down the hatch it went… and I loved it. It is the best tasting veggie cocktail of all time, and my favourite (overall) drink in Japan. While travelling I try to have at least one a day. The imported bottles were even stocked in Toronto for a while a year or two back, and they became regular purchases. They gradually faded off store shelves, and it wasn’t until my recent trip to New York that I saw them again, in both the smaller 8oz size, and the massive “family size” that I ended up buying. And now I will happily share my love of this beverage with you! Packaging: Well, it sold me! Big, beautiful veggies prominently displayed, just enough of the rich orange coloured beverage showing through, it looks appetizing! 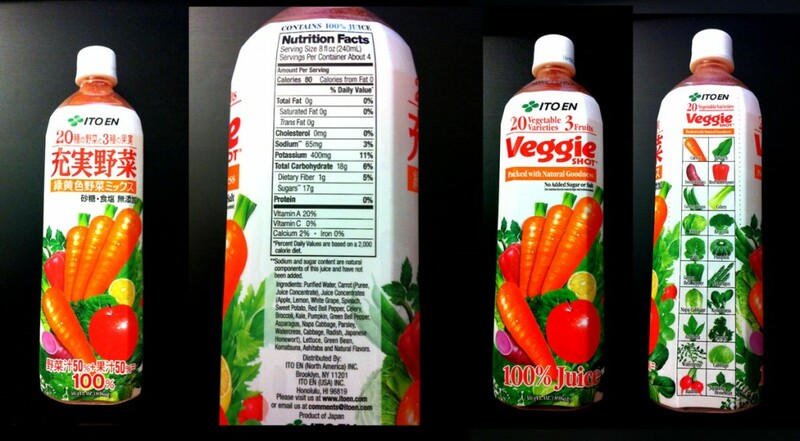 This particular package, while still a product of Japan, features English-language information and branding as well as the Japanese, which is how I know what this product is actually called (I’d just been calling it “The Ito En delicious carrot drink”). Scent: It has a surprisingly strong, rich scent. Mostly you get the carrot juice, but apple, lemon, and white grape are definitely in the mix. It has a pleasant, sweet smell that again is very appetizing, particularly if you’re dreading drinking a vegetable-based drink. Upon reflection, those who do not like pure juices like carrot, apple, or grape because they’re too sweet are more likely than not to be put-off by the scent, as it is considerably sweeter than expected. Taste: Oh, basically perfect. Despite containing more than 20 varieties of vegetables (plus a bunch of fruit juices), the primary tastes are carrot and apple juice, which suits me just fine. There is a richness to the drink that comes from all of the different veggies, but the complete lack of tomato juice instantly gives it a different flavour profile to anything comparable available on North America store shelves. The juice is a little thicker than normal, but without a trace of pulp anywhere in it, which gives it a pleasant texture. Verdict: While it is packed full of fruit and veggie juices and purees, their doesn’t seem to be much in the way of health benefits according to the label. Perhaps the restorative effects of my daily ingestion of Ito En Veggie Shot were entirely in my mind? Perhaps they’re just not listing all of the benefits on the label? Regardless, it’s a delicious, vegetable based drink that’s full of things that are good for you, with no added sugar or salt (and only 220 calories or so for a whole litre). It certainly FEELS healthy, and that’s often enough! See for yourself at the Ito En webpage for this product, http://www.itoen.co.jp/yasai/lineup/product01.html. this writer nailed it on the head. I live in north America and on one of my recent trips with my wife to the asian market i found myself thirsty. 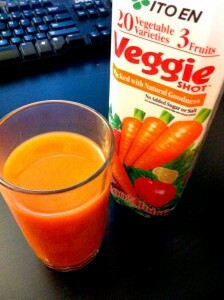 Without much thought i grabbed a bottle of this veggie shot and started drinking. Im no health nut but i do make good choices about what i eat. I would buy this drink again. That’s how i found this article, i was searching the net to purchase some to have it delivered as we don’t frequent the asian market often enough. 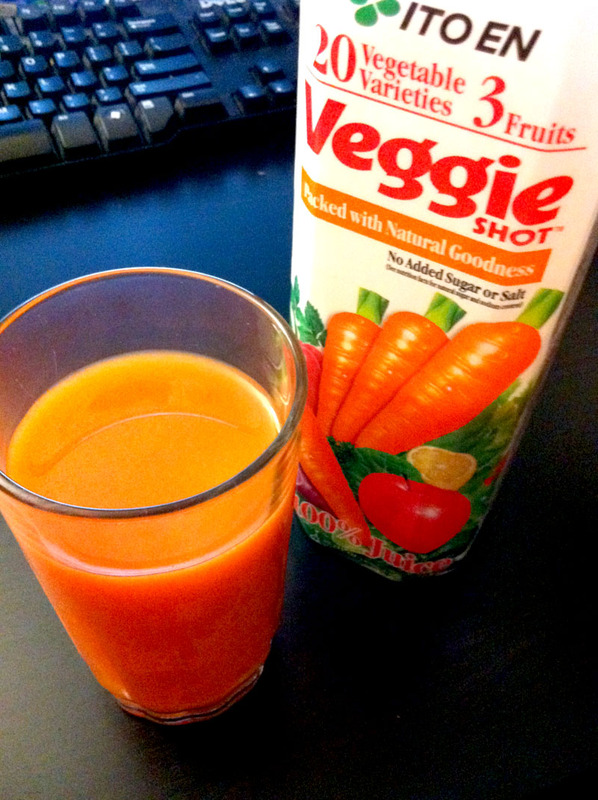 I absolutely agree with both of you on your thoughts about this oh so yummy veggie drink. I started drinking around a year ago after randomly noticing it on the bottom shelf of my supermarket. Thinking and hoping it was going to be a healthy alternative instead of regular fried chicken and soft drink lunches, I took it back to my work place hoping it might last me till the end of the day. But, being as good as it and with the in mind notion that it’s healthy and may have energy lifting benefits, it was gone before I had even finished my 3 sushi rolls. I’ve recommend this drink to all my friends with not one negative response so far, except the question; Is it ‘truly’ good for you? A BIG 10/10 in my books. it’s the purple one that is amazing. knock your socks off amazing. and you can mix it with wine. amazing. anyone else tried it?